This is such a fun quietbook page and study unit! It page sews up quickly, but is a big hit. 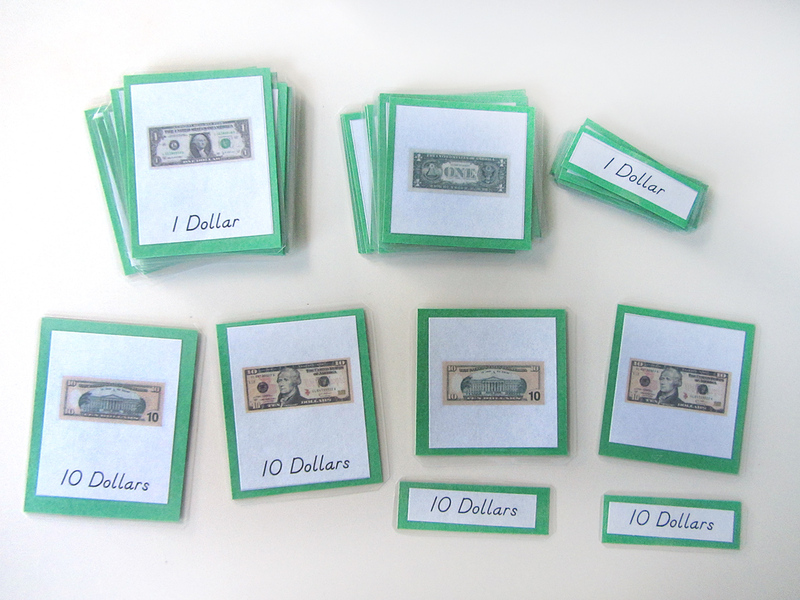 Sorting is always fun for preschoolers, but sorting money is even better! 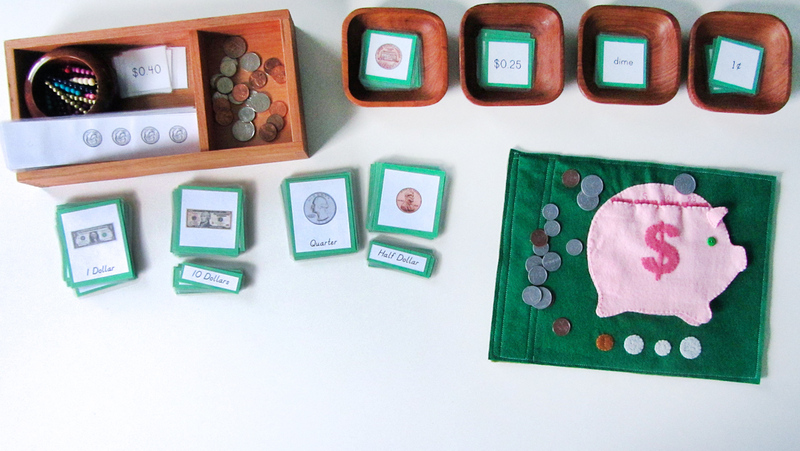 This page features a felt piggy bank with labeled coin slots and a key at the bottom to help kids sort the coins. 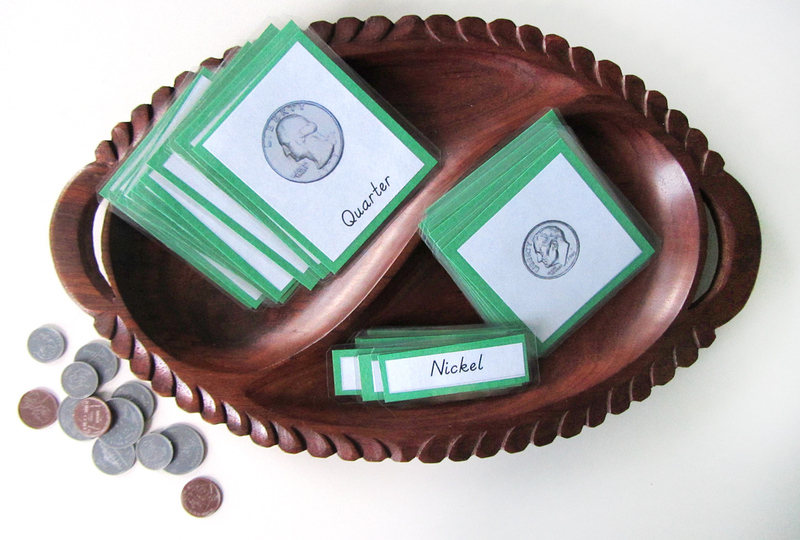 To make this quietbook fit in with our Montessori-style homeschooling, I have created several free printable packs. You can use these with or without the quietbook page. I began the page with the embroidery on the coins. 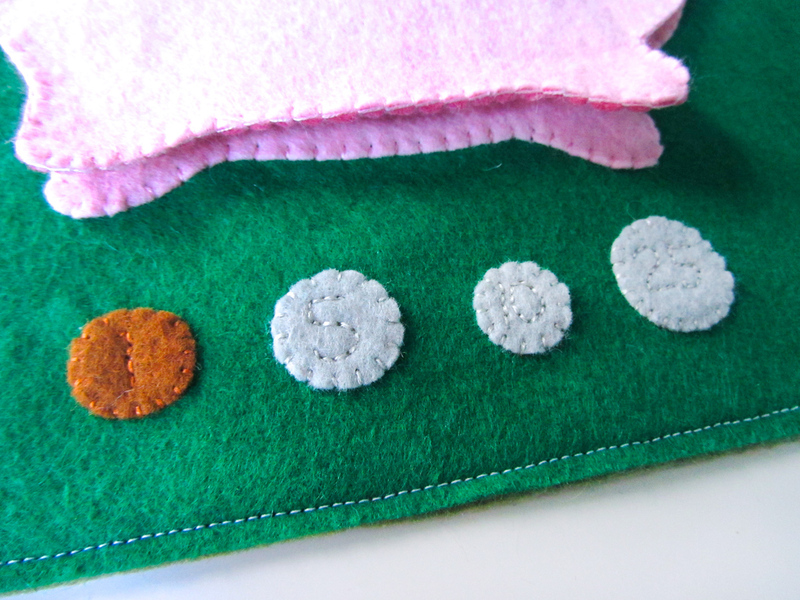 I back stitched the numbers onto each of the coins, then stitched them down to the bottom of the page. 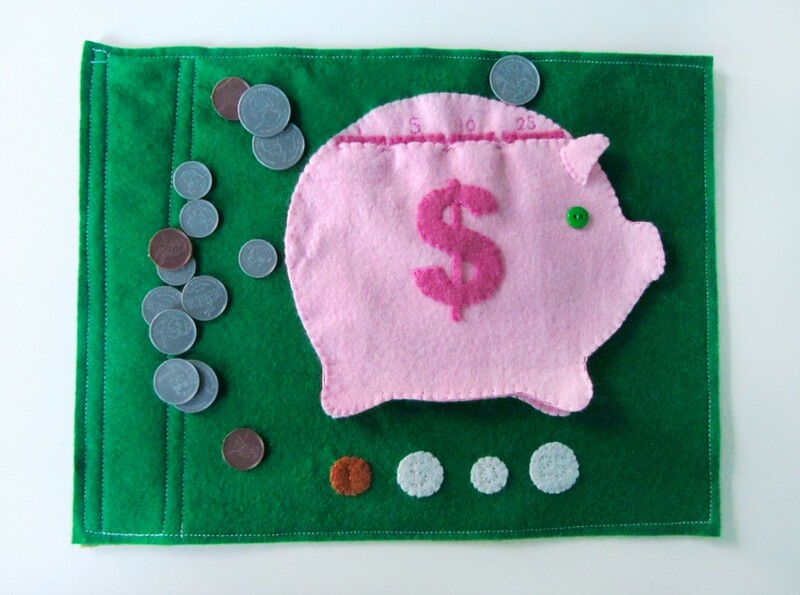 I stitched the smaller numbers and coin slots along the top of the full-sized piggy bank piece. 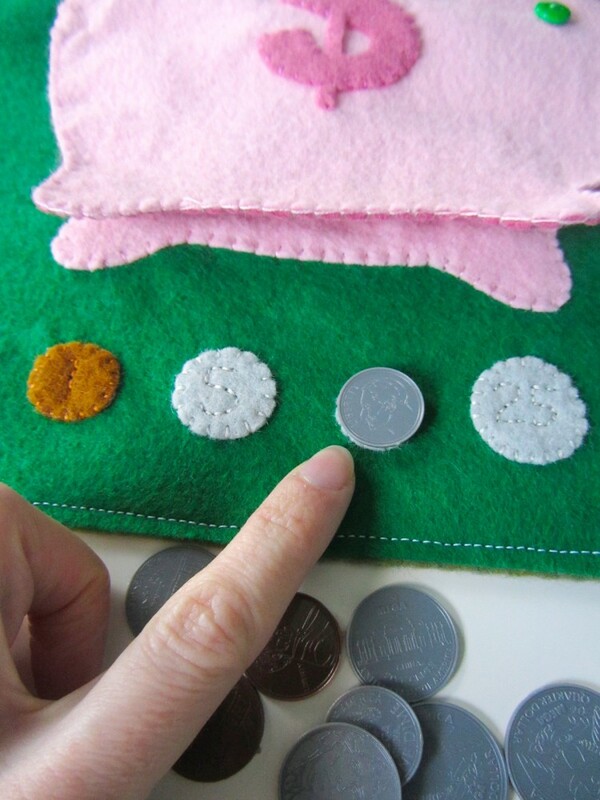 Make sure the slots line up just above the partial piggy bank pieces, as seen in the photos. 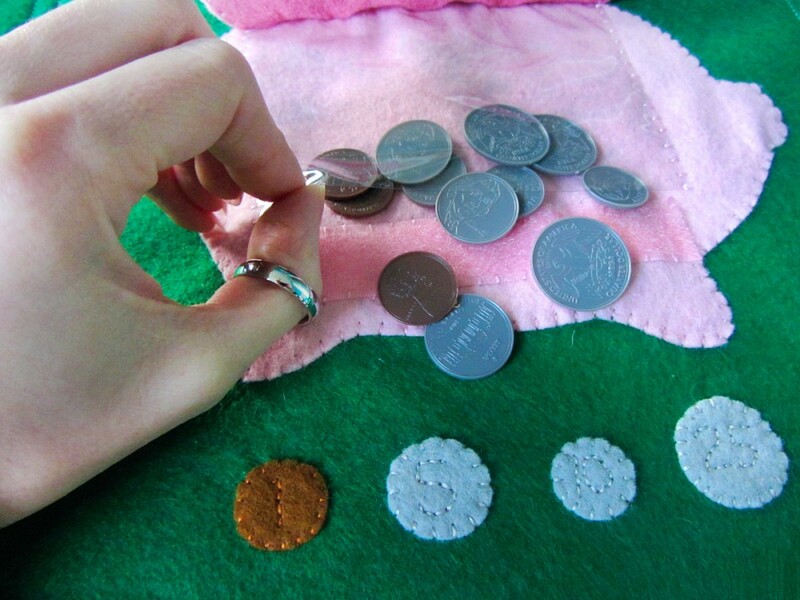 To take out the coins, open the flap. The hook & loop separates and allows access. 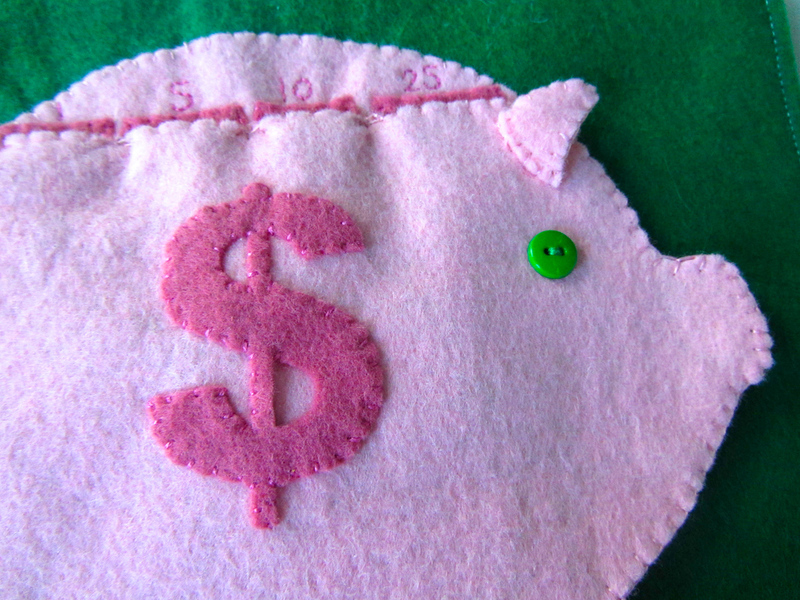 On the outer (light pink) partial piggy bank piece, I sewed down the dollar sign and a button eye. I sewed the two ear pieces together, then attached it to the pig at the base. On the inner (dark pink) partial piggy bank piece, I sewed a strip of pink hook tape towards the bottom (this will need to line up with the loop tape you later sew immediately below the clear vinyl pocket later). 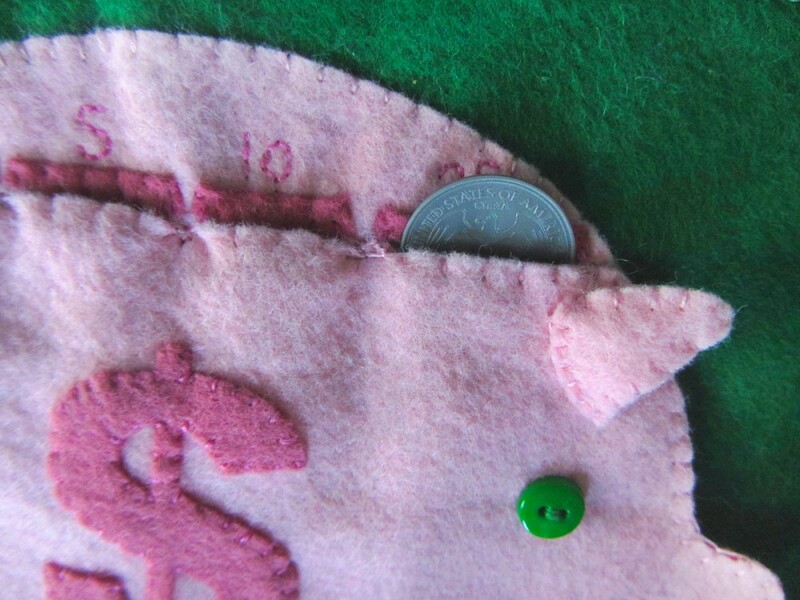 I then sewed the front and back of the piggy bank flap together on the sides and bottom, but not the top. I lined the top of the clear vinyl pocket up with the top of the flap, then sewed through all three layers across the top. At this point, the page was nearly done. 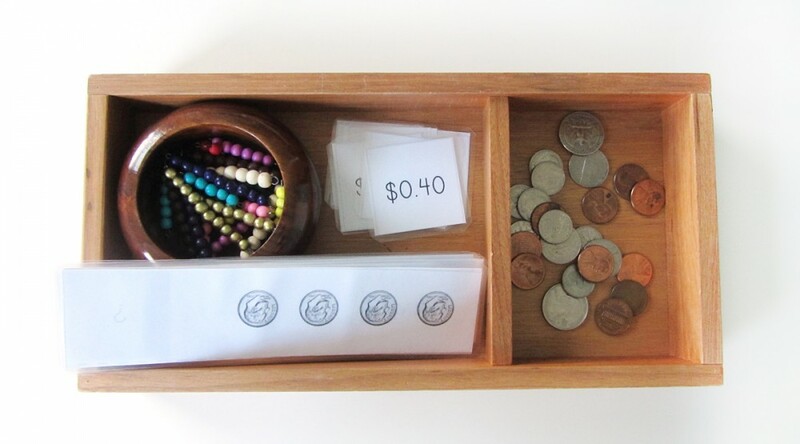 Test out the coin slots, and if yours are a bit too tight for tiny hands as mine were, you may need to tweak. 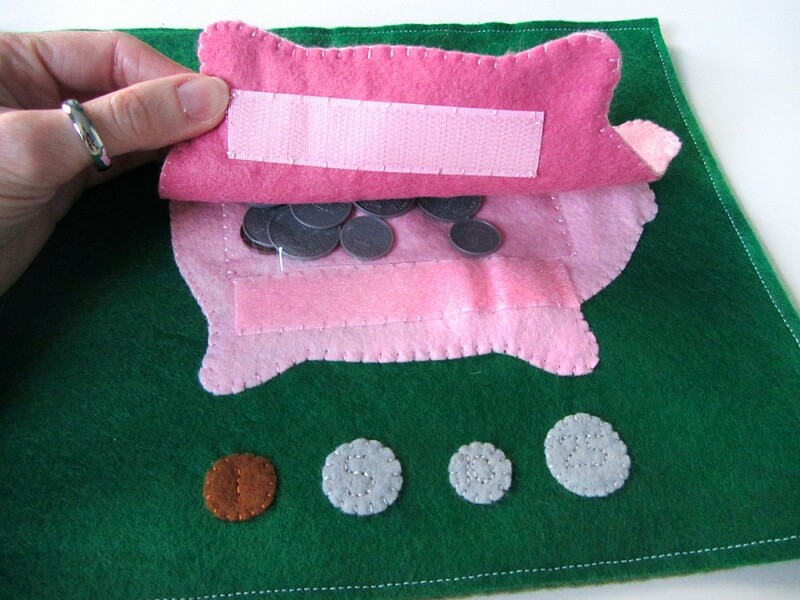 I made the coin slots stretch open a bit by making stitches that pulled the ends towards each other: So the right end of the 5 cent slot was stitched to the left end of the 10 cent slot, etc. 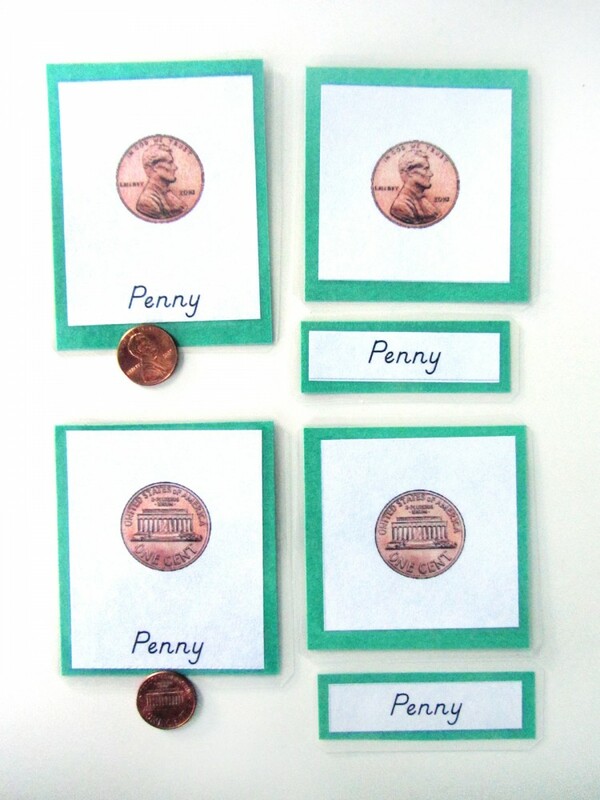 Montessori-style 3-part cards are so great for introducing anything that can shown with a picture and name. They consist of three parts: a labeled picture card, the picture alone and the label alone. A child begins with the labelled cards, then eventually starts matching the labels to the pictures, using the labelled cards as control cards. They can be used as reference for writing exercises later on. Click here to download my free pdf files (here is part 2) to make your own. To make mine, I cut them out, glued them to green construction paper, then laminated them . I included the fronts and backs of each coin or bill. Coins can be tricky to learn. You have how they look, what they are named, plus two ways of writing their values! I made a set of mini cards that can be used to learn and match everything. Add in coins so they can match them to the pictures. 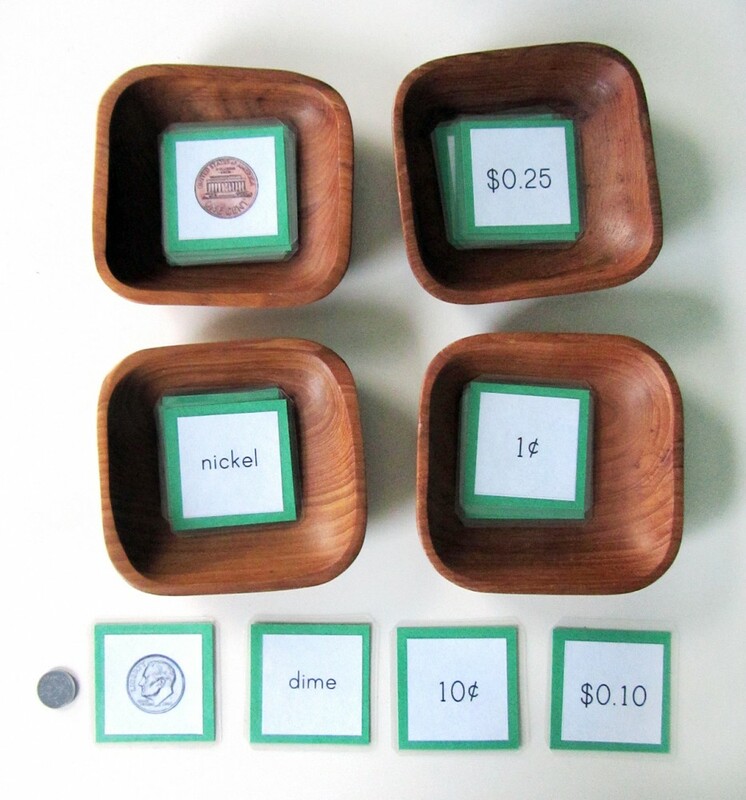 To help Jax learn how to add up coin values, I made a little coin addition game. It can be used at two levels – one side has the values written, and one does not. 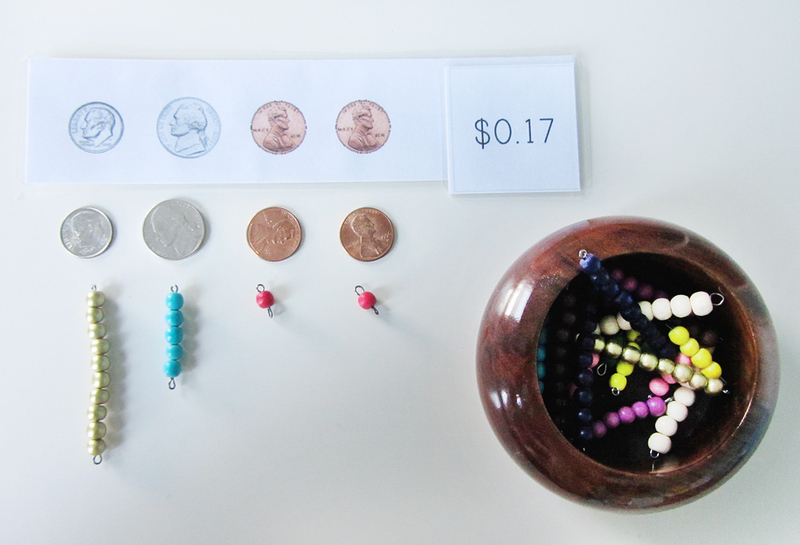 Start with the labeled side, then have your child use beads or counters to add up to the totals. When they are ready, they can use the unlabelled side, then check their answers on the back. To create these, I folded and laminated the strips so they were two-sided. The answers are two-sided as well: I glued the two different ways of writing the answers back-to-back. 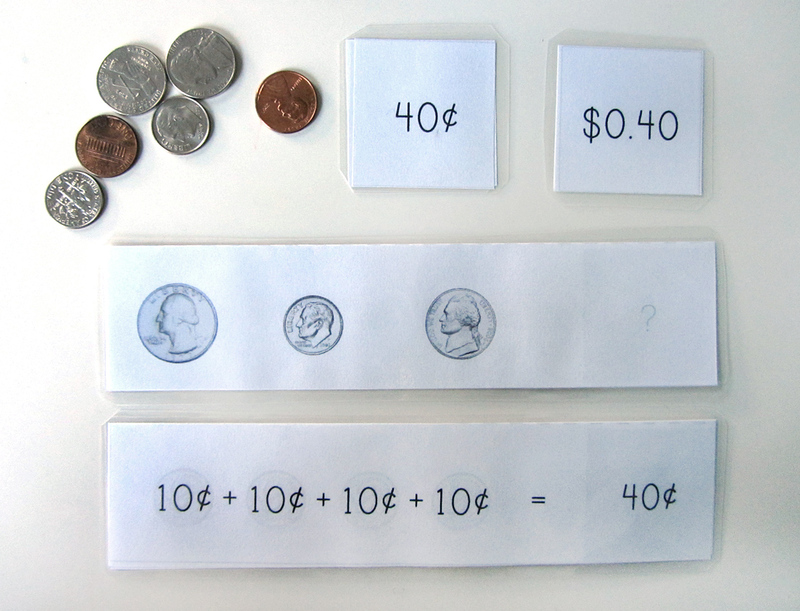 There are also two strips that add up to the same answer, to show there are multiple ways to get the same sum! I hope you enjoy this free quiet book pattern and homeschool printables! 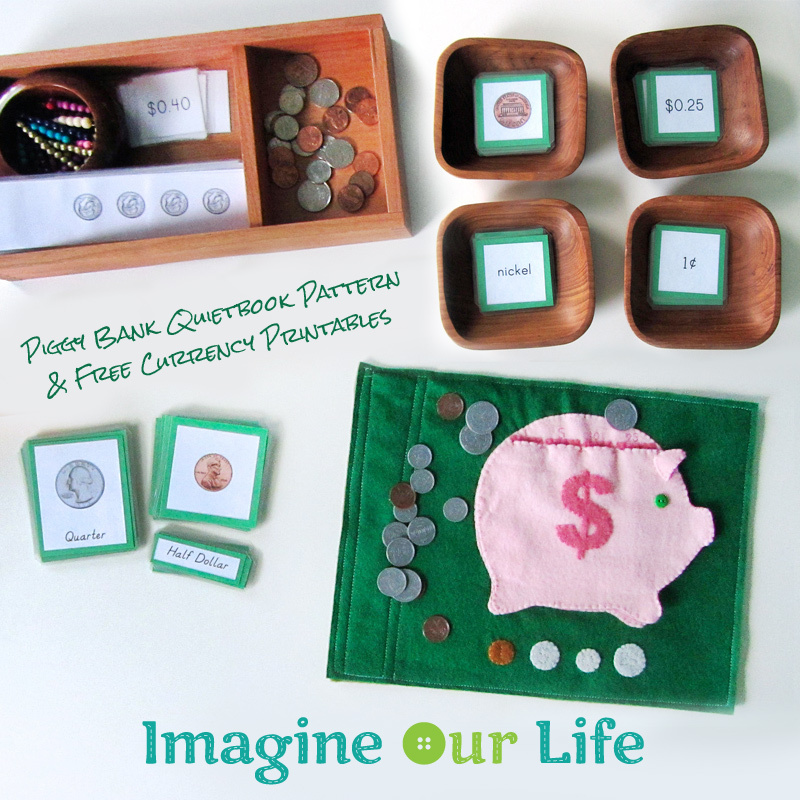 For more homeschool ideas, visit Montessori Monday at Living Montessori Now. 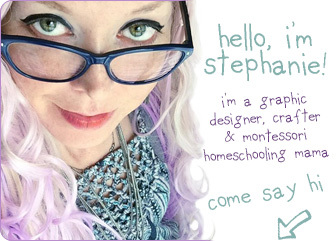 Have you seen my Etsy shop? At the moment, I am selling commercially licensed versions of my patterns to allow crafters to sell finished products from my patterns. I will eventually have some pay patterns to help pay for the site and the time I put into it, but any free patterns will remain free for personal use. Would you like to support my site? 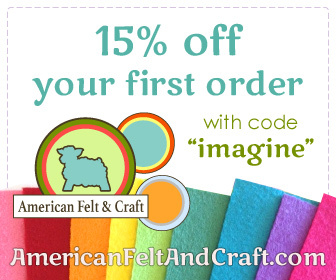 You can purchase one of the commercial patterns regardless of whether you plan to sell the finished item – the money will go towards keeping Imagine Our Life alive! This entry was posted in Homeschool, Montessori, Quiet Book, Sewing on March 9, 2014 by Stephanie. Just working on piggy bank quiet book for my son. Thank you for the beautiful pattern and 3 part cards! Just finished the quiet book page, now working on the cards. Wanted to let you know that there is a small mistake on the $50 3-part card. There is a 5 dollar bill instead of the backside of the 50 dollar bill. Also, I need to print the set out twice to get the control set right? Or am I missing something? Thank you! Thanks so much for letting me know. I fixed the $50 bill and added the missing control cards file! Thank you so much for your quick response! I can’t even begin to tell you how obsessed I am with your work! Amazing and beautiful aren’t adequate enough words to describe what you do! This may be silly, but what kind of thread do you use for this? Also, the website for the clear vinyl was sold out, if I go to a craft store what am I looking for? What would the name or type of vinyl be that I can ask for? Sorry, this is my first attempt to sew. But I love this, I just have to have it. Thank you.